My first blog as a 23 year old. I don't want to be 23, it's too old, I still think I'm 19, not really sure what happened to the years in between. Just a mix of absinthe, failed diets and too many places to call home. My birthday this year was uneventful in the sense that I didn't plan anything, mainly due to my lack of work, therefore lack of funds. However, my besties did not fail me! 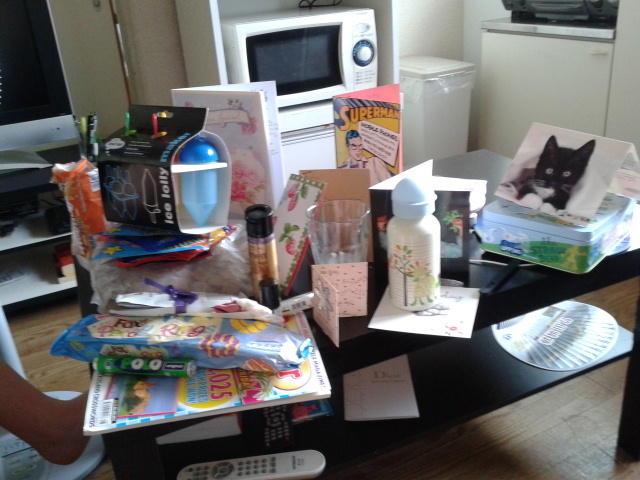 I got a ridiculous amount of love from the UK in the form of chocolate, cereal, biscuits, make up, cards and other shizz which my amazing besties sent to me, god love em. The past week has therefore been a mix of losing my bikini body from all the chocolate, which I'm totally happy about, and a mix of doing sweet FA with my days. However, I'm super excited for Thursday when I go to Taiwan and the Philippines and meet my homeslice Charlotte! Started packing some stuff together and I'm so unbelievably excited. I'm hoping the countries won't be as humid or as hot as Japan. The other day was just a casual 45 degree, whatever. Not much else to report except I'm still melting, I love living with my Aussie bestie and so far 23 is going well. Things I achieved off my list when I was 22: go to Japan, watch all the James Bond films, learn to snowboard, go to Ireland and visit Disneyland Tokyo. Aims for 23 are to: scuba dive somewhere other than England (hopefully achieved in the Philippines in the next few weeks), visit Niagra falls, go below the equator, do a marathon. Busy busy. See you after my jolly holidays.